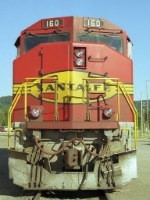 Description: ATSF 160 leads a westbound train. 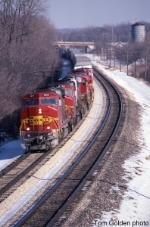 Description: ATSF #2716 is the trailing unit on a huge east bound consist. Description: ATSF 160 East an intermodal train passes under the eastbound signal bridge at Cosnino, Arizona as the sun descends in the west.